Showcase the breadth and depth of global engagement by faculty, students and staff in education, research and policy and civic engagement work. Celebrate and advance Tufts' commitment to global engagement, international exchange and global learning. Promote connection and dialogue across schools and across disciplines on global issues. The Office of the Provost and the Senior International Officer organize and coordinate Global Tufts Week. All Tufts departments, centers, institutes, units, student organizations and groups are invited to host events to celebrate Global Tufts Week. Events can include conferences, speakers, panel discussions, workshops, seminars, performances, film showings, cultural events, music, social and networking events, presentations and lectures, information sessions on programs, etc. Events can be organized specifically for Global Week, and already planned events can be scheduled to take place during that week. Events should be posted through the main Tufts Calendar, and will be displayed on both the main Tufts website and the Global Tufts website. 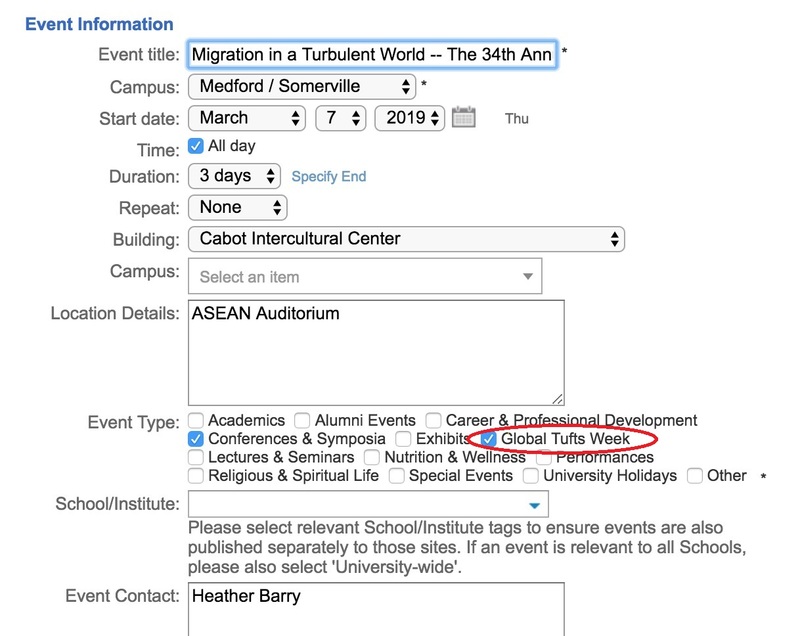 Check the box for "Global Tufts Week" when selecting the event type. Each year, the Office of the Provost will offer funding for events during Global Tufts Week. Any Tufts faculty, staff, or student can apply for funding on behalf of themselves or an organization. Applications will be reviewed by the Senior International Officer, and selected proposals will receive funding in advance of Global Tufts Week. March 2nd - 9th marked the first annual Global Tufts Week. The theme, Linking the Global and the Local, was chosen to provide a unifying concept while showcasing a broad range of Tufts’ global engagement, both international and local, encouraging cross-school and cross-disciplinary collaboration.